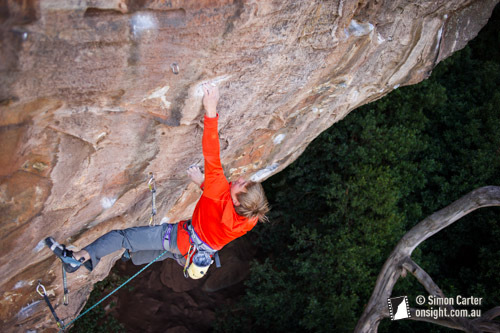 Yesterday (18th August) 20-year-old German climber Alexander Megos capped off a productive visit to Australia by climbing the long-term open project known as The Red Project at Diamond Fall in the Blue Mountains. It took him three days of effort with at least 20 redpoint attempts. Alex has named the route Retired Extremely Dangerous. 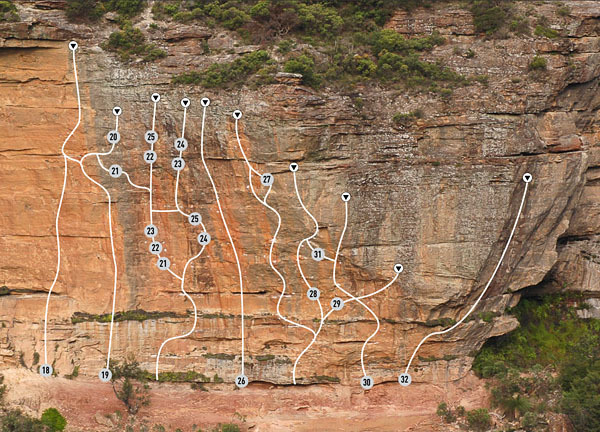 After giving it much thought, and comparing the difficulty of the route with other hard routes that he has climbed here in Australia (and of course also around the world), Alex has decided to propose the Australian grade of 35 (9a or 5.14d) for the route. Given Alex’s experience at that level (which includes being the first climber in the world to onsight a 9a graded route) I doubt there’ll be too much dispute of the grade. So this is the first grade 35 route in Australia! From the guidebook. “The Red Project – open. THE line still to go free here”. It is route #26, the fully independent line. The Red Project was originally bolted by Garth Miller in 1999, and since then has sat there as an open project free for anyone to try. Lee Cossey has spent some time attempting the route over the years and has made good progress on the route. Lee actually encouraged Alex to attempt the route and kindly offered some beta which may have proved useful. 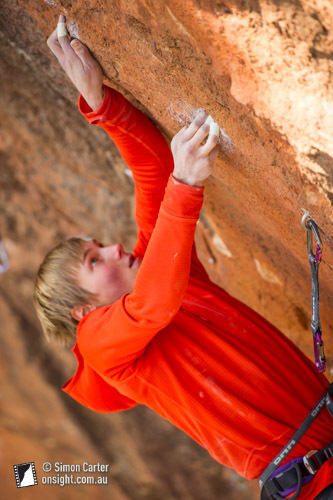 Alex Megos attempting The Red Project, now known as Retired Extremely Dangerous. Low on the route – one of the first hard moves. On his first day of attempts Alex worked out all the moves and had several redpoint attempts. The next day he had about eight redpoint attempts and it looked as though he would do it easily — but the route has a definite crux about 3/4’s of the way up, and although Alex could do the moves easily on the dog they required a degree of precision that proved hard to link from the ground. So then Alex took a rest day to grow skin and returned to the route yesterday (day three of attempts). It started well but after many redpoint attempts I was starting to think it was unlikely that Alex would send it that day. The route was in the sun and Alex’s fingers were getting hammered. After taking the big whipper from the crux six or seven times Alex became frustrated. He lowered to the ground, pulled the rope, re-tied andÂ immediately started climbing again. Somehow this tactic worked because this time he got through the crux — and it was a mighty fight to the end! Also low on the route. I went out to Diamond Falls and photographed Alex on the three days that he attempted it. I can testify that it has been cold and incredibly windy these last few days, yesterday especially so, and hanging off the cliff for hours wasn’t much fun. But at least it seems it was good conditions for hard climbing. The photos that I’m posting here are some “out-takes” whilst I’m offering my better shots to clients. 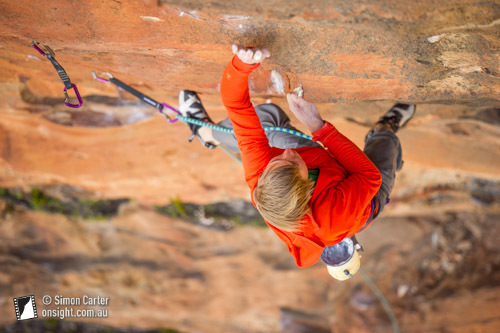 So congratulations to Alex and personally I think it is great to see some progression in the top end of Australian climbing. The last time a new grade in Australia was achieved was when Chris Webb Parsons climbed White Ladder (34) at Nowra in 2004. Despite what that time period might suggest, and considering how much the rest of the world has moved on in that time, I still think it’s probable that the top Australian standards has moved on significantly in that time. It’s likely that we do have some harder 34’s (8c+’s) already and I would not be at all surprised if Retired Extremely Dangerous now received a fast repeat from a local. In any case, I think it’s good for someone with Alex’s experience to come and set a benchmark like this. Alex sending Mechanical Animals (33) on his 3rd shot (that is, one dog and then second redpoint attempt, since that’s the way we count things in Oz). 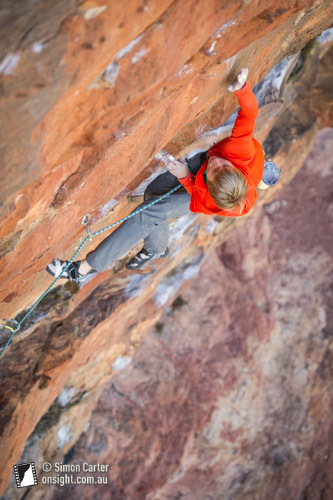 This morning I chatted with Alex about Retired Extremely Dangerous and other routes that he has climbed out here in Australia, so here’s a bit more news. 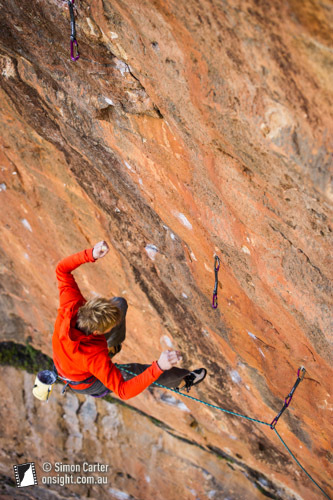 At Arapiles he climbed Somalia, he dogged it one afternoon and had three redpoint attempts that day, then sent it first shot the next morning. He said 33 (8c) is probably right for that one (although it felt more like 8c+ to him initially, he afterwards spoke with Wiz Finneron — the first ascentionist — and learned that he’d missed some drop-knee beta that would have definitely helped). In the Grampians Alex sent Groove Train, again working it one afternoon then sending it first shot the next day that he was on it. He found the crux was extremely reachy (he’s 172cm) but the rest of the route was his style, saying it was definitely 33 or 8c, not harder, even if the extremely run-out nature of the route might make it feel that way. He also said that Groove Train was “one of the best I’ve ever climbed”. Then up here in the Blue Mountains he flashed Pooferator (31), sent Truckstop 31 (32) first shot (a flash except that it shares the start of Pooferator), onsighted Fabricator (28) then sent the link-up of Keep on Trucking (33) next shot (it starts up Pooferator and finishes up Fabricator – which he’d sussed) — all in the one day. He confirmed those grades for those routes although said there wasn’t much in it between Truckstop and Keep on… And another day he sent Mechanical Animals comfortably on his third shot, confirming the grade as 8c or 33. Thanks for reading my blog! Please also follow me on Instagram here and Twitter here. Edit 24/8/13: It had been reported elsewhere that Alex had climbed the The Wheel of Life boulder problem in the Hollow Mountain Cave in the Grampians in two sessions. Well following on from that, yesterday Alex mentioned to me in passing something else that has so far gone unreported. In the same cave he climbed another boulder link-up that which he feels is significantly harder than The Wheel of Life. Alex called it Wheelchair and gave it a route grade of 9a+. Alex said The Wheels of Life deserves a route grade f 9a, so I guess that makes Wheelchair the hardest boulder problem in Oz? For those in the know, the problem starts up The Wheel… but half way up Sleepy Hollow it traverses into Stimulation and climbs the whole of Stimulation (exept for the first move) until its end (which is also the end of Silverchair). Hence Wheelchair. Nice one Alex! good to see the German’s setting the standard again in OZ. Go Franken Power!! Nice write up Simon! 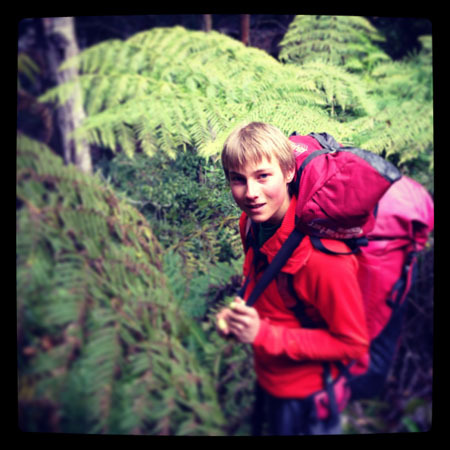 Great to see one of the world’s best confirming the grades at the higher end of Australian climbing. Would be nice to one day, have a crack at something 30+ myself but i’m a little way off, for now..
You’ll have to go back a a couple of editions of blue mountains guidebooks to find routes that aren’t a soft touch let alone a sandbag.